Whether in a vanilla crème or as the base of a hot fudge sundae, nothing matches the taste of really good vanilla. So, a big thank you to the people of Mesoamerica where from come two of my favorite foods. 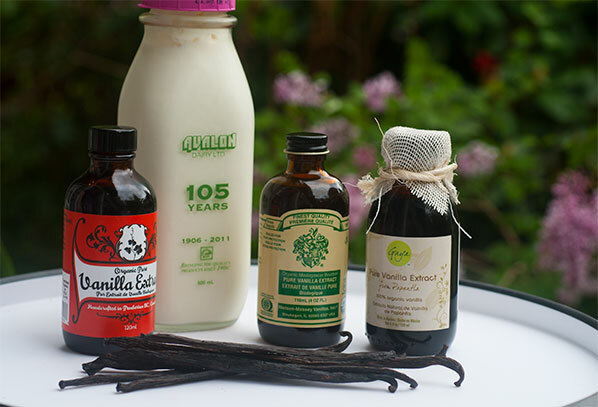 And as in the creation of good chocolate, it takes a lot of effort to produce real, good quality vanilla. Originally, it could only happen when the flower of the vanilla orchid was pollinated by its natural pollinator, the local species of the Melipona bee. Since the flowers shrivel up and drop off after a day, if not pollinated, the window of opportunity for the plant to produce fruit (the vanilla bean) is slim. When, in the early 1800s, people began importing the vanilla orchid, they were unsuccessful in producing any vanilla beans until, in 1841, a 12 year old slave named Edmond Albius came up with a method to hand-pollinate the plant, using a sliver of bamboo and a thumb. 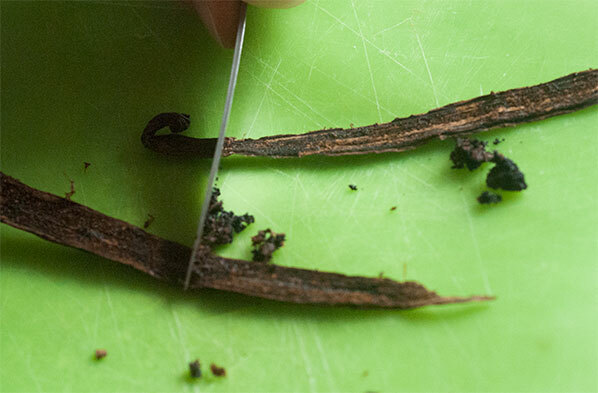 This is the method still used in the production of vanilla in most of the world, today. 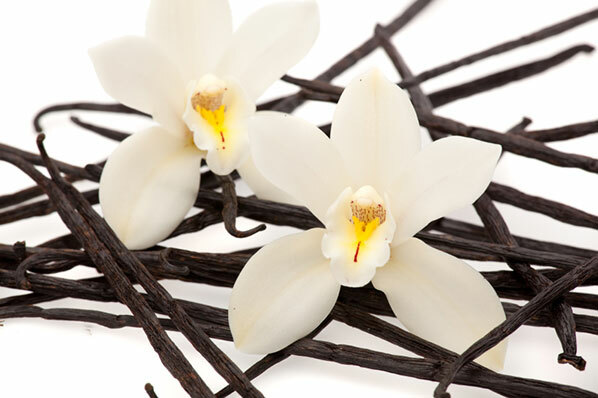 Today, vanilla is produced in Madagascar, Mexico, Tahiti and the West Indies and the terroir (climate, soil, neighbouring plants, and differing strains of the vanilla orchid) of each of these regions produces vanillas with differing taste characteristics, just as in chocolate. And today, with my willing family, I am conducting a taste comparison of four different vanillas, including one vanilla bean and three extracts. 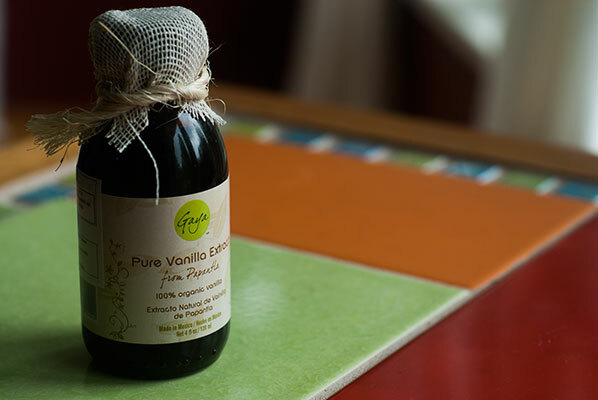 The extracts all come from vanilla beans of the vanilla planifolia species, although grown in different regions of the world. 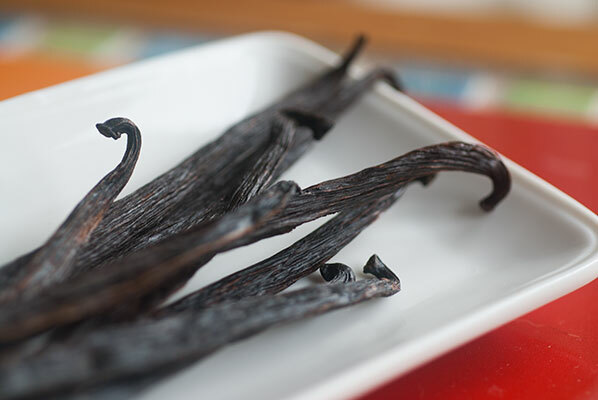 Tahitian vanilla beans actually contain far smaller amounts of vanillan (the chief flavour of vanilla), because they are a different species – the vanilla tahitensis, but are known for their “fruitiness” and fresh flavour, with a slight taste of anise. 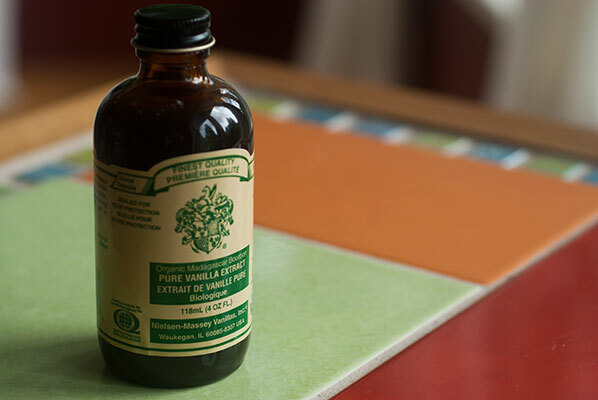 Sample #3: Organic Madagascar Bourbon Vanilla Extract – Nielsen-Massey Vanillas Inc.
Hmm, I will be curious to see how the added sugar affects the flavour of this one. I couldn’t find out much about this vanilla, but Mexican vanilla is supposed to be a little warmer and spicier than others. It had been recommended to me by one of the staff at a local gourmet store, so I thought I would try it. It is also the only one of the extracts to list the vanilla bean extractives as the first ingredient – the others listed water first. 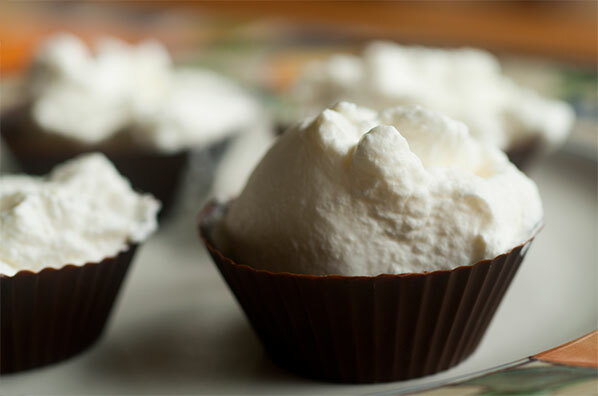 I temper some 64.5% cacao chocolate (Belcolade pastilles) and mold 16 shells in miniature silicone baking cups. I love doing these. They always remind me of my Mum, who taught me how to make them when I was about seven years old – using paper baking cups instead of silicone. 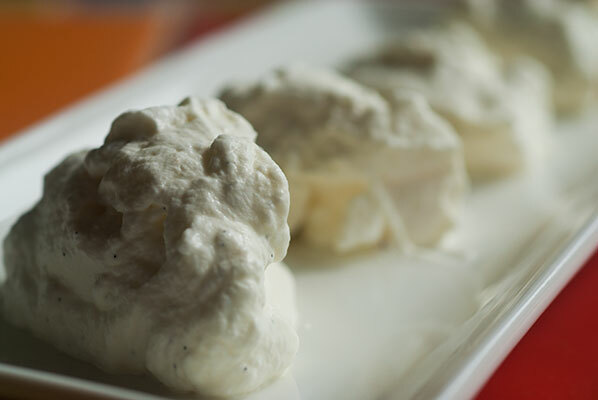 These will provide the base for the dollop of heavy whipped cream, which will be the vehicle for the vanilla. For the other three samples, I use ½ teaspoon vanilla extract per half cup sample, once again, adding it at the beginning of beating. I love whisking, and because this cream is so rich, in short order I have my four sample bowls of cream ready for the tasters. They are each given four spoons (with a request not to double-dip into the same bowl on second tastes), I put out the chocolate shells, grab my pencil and pad, and we all line up to taste. 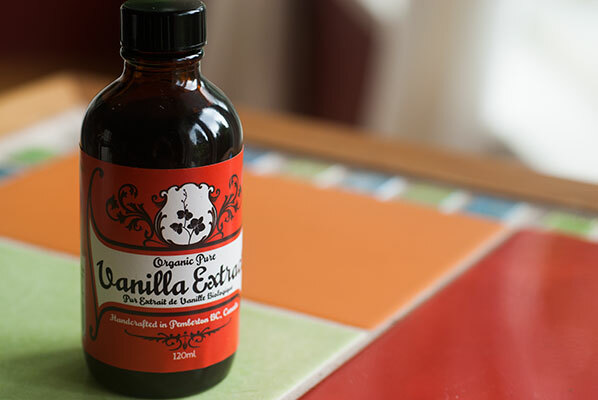 #3 Organic Madagascar Bourbon Vanilla Extract – Nielsen-Massey Vanillas Inc. When we sample the cream with the chocolate cups, the results were surprisingly similar, so although we were adding in the very dominant chocolate flavour, the characteristics of each vanilla seemed to remain constant. Although I tried to be very consistent with each sample, I am sure there were variables that can come into play with distribution of the extract, temperature of the cream, and consistency of the whip. 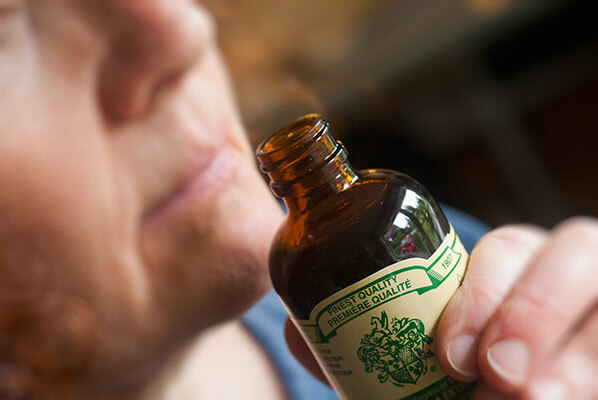 In conclusion, on that day, we all seemed to prefer the sample made with the Tahitian vanilla bean (perhaps the flavour concentration was stronger), and also liked the boldness and fruitiness of the Pemberton Distilleries Costa Rican bean extract. Perhaps it was the flavour of their potato spirits that we enjoyed! In any case, as a love of vanilla, every one of these good bottles will be put to use over the next year – although I learned in my reading that a good vanilla extract will age like a good red wine, deepening with flavour and complexity if allowed to sit in a darkened, cool place. Perhaps I’ll put one of them away for that purpose … or perhaps we will just make another dozen batches of ice cream.